Make your free phone consult reservation now and get a special internet rate. If you are interested in no mesh hernia surgery, please call us at 239-266-2925 or click on the free phone consultation form above. 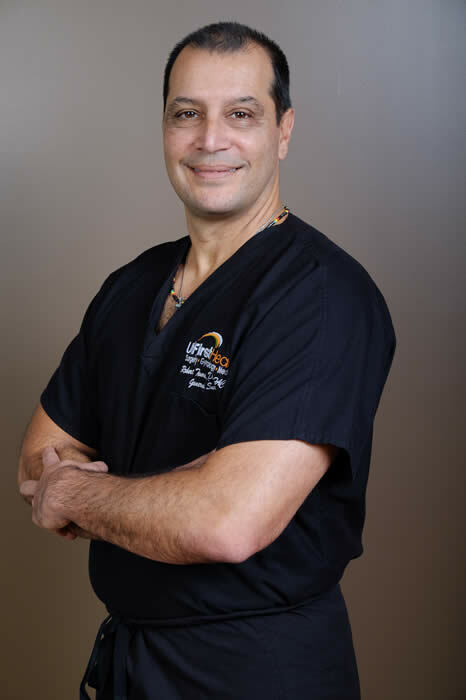 Dr. Robert Tomas is the only US surgeon trained to perform the Desarda No Mesh hernia technique. Hello my name is Dr Robert Tomas and I want to tell you about the best kept secret in hernia surgery called the Desarda technique. I have performed over 3000 inguinal hernia surgeries using the Desarda no mesh tension free hernia repair and have had excellent results in which I’ve had a recurrence rate of only 1%. Don’t let your doctor place mesh in your groin when you can repair primary hernias with this Desarda no mesh technique. A trip to Fort Myers, Florida is well worth the trip if it means avoiding a piece of mesh being placed in your groin (inguinal hernia) or your body wall (umbilical/ventral hernia). Your research should end here and you should call us today in order to schedule your surgery within 1 to 2 weeks. You can also press the Make Your Reservation button below and let one of our staff members schedule your free consultation. Inguinal hernias are the most common type of hernia. They represent approximately two thirds of adult hernias and are much more common in men than in women. They occur in a part of the abdominal wall known as the inguinal canal, where a man’s testicles must descend before birth. This leaves a natural defect called the internal inguinal ring that can develop into a hernia if it doesn’t seal properly. As a result, the contents of the abdomen, such as intestine, may protrude through the opening, creating pain and/or a bulge. Inguinal hernias are located in the lower abdomen just above the leg crease, near or adjacent to the pubic area. They can sometimes occur on both sides of the pubic area, and if they do, they are called bilateral inguinal hernias. Inguinal hernias, along with femoral hernias make up the 2 types of groin hernias and can produce pain that extends into the upper thigh or scrotum. 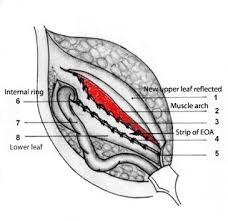 An indirect inguinal hernia occurs through the natural weakness in the internal inguinal ring. A direct inguinal hernia is a result of weakness in the floor of the inguinal canal and is more likely to develop in older men over the age of 40. The floor of the inguinal canal is located just below the internal inguinal ring. If you are interested in no mesh hernia surgery, please call us at 239-266-2925 or click on the free phone consultation form below. Now you can get your hernia repair without mesh and it is as strong as a repair as if you had mesh. This is a technique that incorporates your own body wall (fascia) into the repair with two rows of sutures for support of the inguinal floor. You will have no muscle weakness from the use of the muscle strip for the repair of your hernia. See Schematic of repair below. Here you see a hernia protruding from the floor of the inguinal canal. The first row of sutures is used to cover the defective floor of the inguinal canal and as you can see the hernia sac is no longer visible. Then, to reinforce the floor, a second row of sutures is used with the adjacent muscle belly of the inguinal canal. This reconstruction of the floor provides strong support. 72 YM who flew down from New Hampshire with extremely large bilateral inguinal hernias for over 25 years and wished to have them repaired with No Mesh, Desarda Technique. Performed by Dr. Robert Tomas. 44 YM who presented to the emergency room in excruciating pain and a large inguinal hernia on the right that was extremely large and under pressure. A second incision on the right scrotum was needed in order to reduce the intestines. He wished to have it repaired with No Mesh, Desarda Technique. 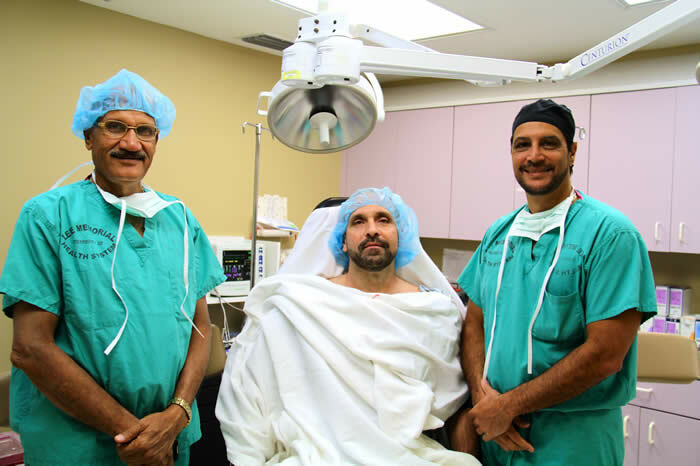 This surgery was performed by Dr. Robert Tomas as an emergency at Gulf Coast Medical Center. 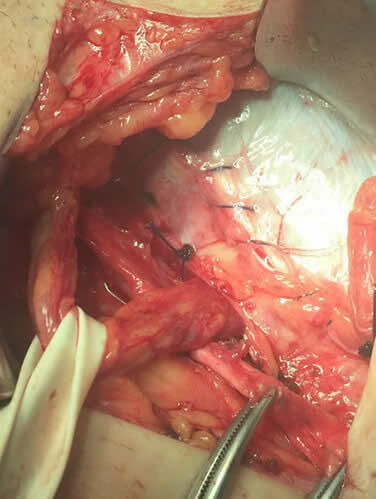 73 YM who drove down from Tampa, Florida with extremely large right inguinal hernia,basketball size, and a smaller left inguinal hernia for several years and wished to have them repaired with No Mesh, Desarda Technique. Performed by Dr. Robert Tomas. 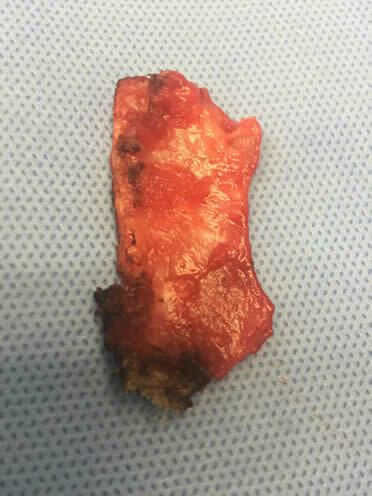 A 64 YM came down from northern Florida with this large hernia that had an obvious large section of his intestine in his scrotum. He did not want mesh at all, so he came to the Desarda Hernia Center, USA® . The surgery was performed under general anesthesia in order to reduce a large section of the small intestine and right colon back into the peritoneal (belly) cavity. It was performed by Robert Tomas, D.O, FACOS in Novemeber, 2015 with no mesh. Even these large hernias can be repaired with the Desarda technique. 45 year old male complaining of pain for several years after inguinal hernia mesh repair. He was unable to play hockey without pain. Dr. Robert Tomas recommended mesh removal. He was pain free after the surgery. Please note the reconstructed floor of the inguinal canal after mesh removal. Strength of the floor is the patient’s own external oblique muscle strip. Reconstructed floor of the inguinal canal without mesh -Desarda Technique. When I was first diagnosed with a hernia by my urologist and started doing research, I became very disconcerted when it appeared that the main method used consisting of mesh and staples only had a 47% success rate….meaning the surgery has long term failure rate of almost half. I am very active at 58 as I have an 8 year old son and I coach/play baseball, football and basketball with him, go wave running, snowmobiling….not to mention wrestling and the flying leaps that an 8 year old takes…failing to realize of course that he weighs 64 pounds and his dad is old. Through continued research, and a stroke of luck, I discovered the Desarda, no mesh, tension free method and Dr. Tomas at Ufirsthealth. I started doing more research and discovered that it had a tremendous success rate so I contacted Ufirsthealth and sent an email under the “Ask the doctor” icon. Within a half hour, Dr. Tomas responded and gave me a number to call him at so he could explain the surgery to me. I called, he answered, and spent about ten minutes on the phone with me explaining the procedure. That was a first. 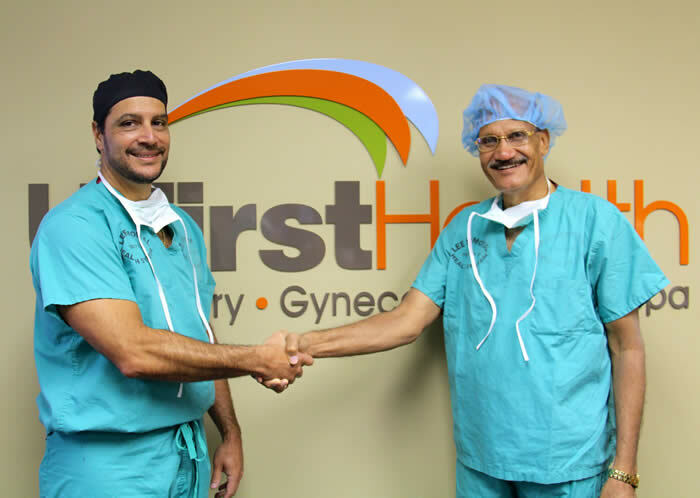 I drove to Ft Myers and found the entire staff to be “first rate” and when I met Dr. Tomas, his demeanor alone gave me all the comfort and confidence I needed and had the surgery done the next day. About two hours after my arrival, I was on my way home to Tampa, feeling great considering I just had surgery and outside of normal discomfort associated with any type of surgery, I had no issues whatsoever and was back on my treadmill the second day after surgery. After three weeks, feeling great, almost back to normal activities and I have nothing but accolades regarding the procedure, Dr. Tomas and his first class team of professionals.